Dorothy Tillman was born in Montgomery, Alabama in 1947. 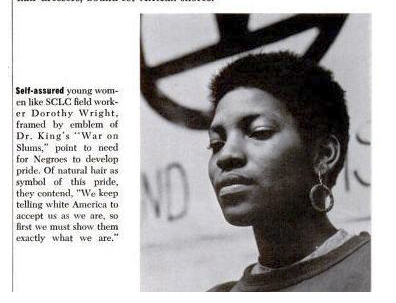 She joined the Southern Christian Leadership Conference (SCLC) as a trainee and field staff organizer in 1963. Tillman marched with King and was among the SCLC Field Staff to cross the Edmund Pettus Bridge in Selma, Alabama in the Selma to Montgomery marches on 7 March 1965. She had her first involvement in Chicago politics later in 1965 when King sent her there to campaign for better housing, education and employment conditions for blacks. This campaign marked the start of King's effort to improve socio-economic conditions for blacks. Tillman was involved in organizing King's move into a Chicago tenement in early 1966 and the launch of his campaign in July 1966. While in Chicago, Tillman met her husband, blues drummer Jimmy Lee Tillman. The Tillmans moved to San Francisco shortly after their marriage and became involved in a successful campaign to improve public transport services to their neighborhood. The Tillmans later returned to Chicago where Dorothy Tillman became involved in educational issues. She founded the Parent Equalizers of Chicago, which eventually became active in 300 schools across the city, setting the groundwork for school reform in Chicago. The momentum created by several successful grassroots campaigns Tillman help organize led to the election of Chicago’s first African American mayor, Harold Washington. Dorothy Tillman was elected as an alderman representing Chicago's Third Ward in 1985, being the first woman elected for that ward. Tillman pioneered the first TIF to be used in the black community, with the construction of the 55th and Dan Ryan shopping center. She helped to found the African American Home Builders Association and advocated for a 70/30 plan to make certain that African Americans received the majority of the contracts.In 2000, Tillman requested that two waiters at the Palmer House hotel in Chicago be replaced with African-American waiters for a banquet hosted by Alderman Tillman. Chicago mayor Richard M. Daley delivered a strongly worded rebuke in the media. Tillman was an advocate of reparations for slavery and was successful in having a number of resolutions passed in support of the concept. She authored a bill, passed unanimously in 2002, forcing companies who perform contracts with the council to declare any past ties with slavery. In early 2005, Tillman led a campaign against a $500 million refinancing deal with the Bank of America because of its alleged links with slavery. In the case of the Bank of America, these links are allegedly through FleetBoston Financial, a company which it acquired in 2004. Providene, a predecessor of Fleet Boston, was supposedly founded by a slave owner in 1791. During one loud session of the City Council, Tillman gained the attention of the entire floor when she produced a pistol from her handbag and brandished it about. This led calls by some aldermen and Chicago citizens to call for a censure on Tillman's professional ethics, and possible mandatory gun safety training. "Tillman has been involved in the Harold Washington Cultural Center (HWCC) since its inception. A 2006 three-part investigative report by the Chicago local paper Lakefront Outlook reported accounting irregularities and conflicts of interest by Tillman and her family. Despite the controversy and his stand on ethics reform, U.S. Senator Barack Obama endorsed Tillman in her 2007 election noting she was an early supporter of his. Although she had the backing of Chicago's Mayor Richard Daley, Tillman was not able to achieve a majority of votes in Chicago's non-partisan aldermanic election in February, 2007. As a result, Tillman stood in a runoff election against challenger Pat Dowell. Dowell took 54 percent of the vote to 46 percent for Tillman. During a heated debate between Tillman and Dowell on April 3, 2007, Dowell charged Tillman with failing to produce business growth beyond the street corner where her ward office was located and stated "I will be the change agent," after which Tillman's daughter (and political staffer) shouted out "A white man agent!" In October 2008 Tillman was convicted for criminal trespassing at an Alabama hospital in March 2008. A dispute over medical records escalated and the police were called. Tillman claims she was brutalized by the police. She was fined and received a suspended sentence. Her lawyer stated that an appeal is planned. The charge was eventually dropped as part of a settlement with the hospital. ↑ "Tillman Opponent Gets Endorsement". Chicago Tribune. February 18, 1985. 1 2 Jackson, David and John McCormick (2007-06-12). "Critics: Obama endorsements counter calls for clean government". Chicagotribune.com. ↑ "Long Island University Announces Winners of 2006 George Polk Awards"; http://www.brooklyn.liu.edu/polk/press/2006.html, "Long Island University"
↑ "Union candidates surprise Daley-backed Tillman, Haithcock, Coleman," April 18, 2007 Chicago Sun-Times, p. 23. ↑ CBS (2008-03-02). "Former Ald. Dorothy Tillman Arrested And Released". CBS. ↑ Spak, Kara (October 3, 2008). "Former Ald. Tillman guilty of trespassing in Alabama". Chicago Sun-Times. Retrieved 2008-10-12.